Tried and tested job interview advice to successfully close your job interview. Closing techniques that work! The final stage of the job interview is critical, you need to leave the interviewer with the certainty that you are the right candidate for the job. Take some control at the end of your interview and positively influence the outcome of the job interview. An effective interview closing will leave a lasting impression. There are a number of ways to conduct your closing. How you choose to close will depend on your personal style and that of the interviewer. Consider what has happened during the interview when deciding how to close. 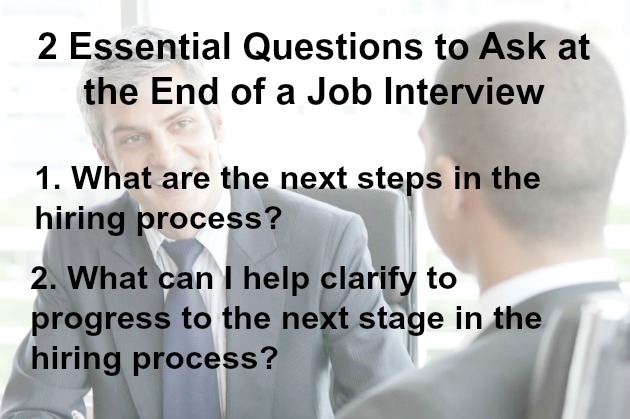 The best ways to end an interview all include these basic closing guidelines. 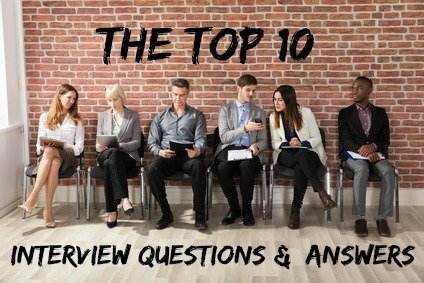 Make sure you have gone through all your questions to ask the interviewer about the job, company and management. Ask any questions that may have resulted from the information exchanged during the interview. "Can I ask you a couple more questions before we end the interview?" Once you have had an opportunity to ask your questions, the interviewer will probably say something like, "If you have nothing else, that will be all. Thank you for your time." This is the time to make a positive closing statement by highlighting why you are the best job candidate. Good job interview advice is to refer to your strengths and how they make you a good fit for the position. Restate the skills and experience you can bring to the position. Use your knowledge about the company to offer up insightful reasons for your suitability. "This certainly is an exciting opportunity and I believe that I am the right candidate for this position. My experience as a team member will add value to the creation of this new sales team, my knowledge of the customer base and the area will help grow your business and my sales performance shows my commitment to achieving targets. I have also implemented a number of strategies that could be successfully used in this position." "As you can see, I believe I have the qualities you are looking for in this position. Are there any issues or concerns that would make you think otherwise?" This allows the interviewer to honestly express any objections and gives you the opportunity to overcome them before you walk out the door. Ask if there is anything else you should provide to support your application, such as references, work samples etc. Make a time to deliver these personally if required. End your job interview on an enthusiastic but not aggressive note. Emphasize your interest in the position and company but avoid sounding desperate or over the top. State how exciting and challenging the position sounds. You can use your background research and the job interview information you collected to prepare a few flattering comments about the company. Unless it has already been clearly outlined during the job interview you need to know exactly what happens next in the hiring process - a second interview, assessments, a medical or an employment test? Try to establish the time frame for a hiring decision to be made. Find out who you should get in touch with to follow up the status of your application. Should you phone or email? "I would like to know what the next step is and when you will be making a final decision so that I can follow up." Clarifying this information not only lets you know what is happening but also shows the interviewer that you are professional and organized. Thank the interviewer graciously and sincerely for the time spent with you. Give a firm handshake and make confident eye contact when doing this. How do you leave an impression at an interview? 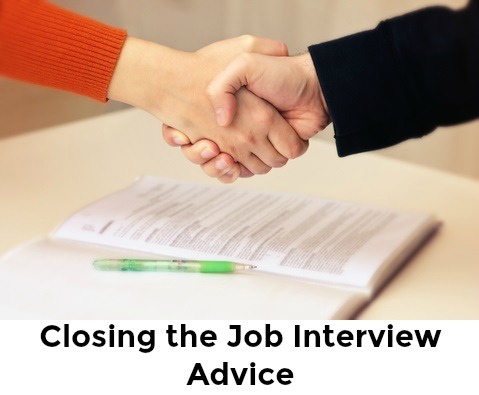 One of the best pieces of job interview advice is to practice your closing. Rehearsing your closing statements will help you leave the impression of a confident, organized candidate. Go to these examples of closing statements for interviews to help you prepare your own closing statements. What about after the interview? Use this prepare for job interview advice to be ready to succeed in your job interview. This site is full of free job interview advice. Use the search box below to find exactly what you are looking for.